7:00pm play followed by panel discussion and reception. Your RSVP is appreciated. After the discovery of the structure of DNA by Watson and Crick, the race was on to discover how the information encoded in the sequence of DNA is converted into the sequence of amino acids that make up proteins. The race to find the “messenger” culminated in two back-to-back papers describing the discovery of messenger RNA in Nature in 1961. One was from Sydney Brenner’s group (coauthored with Francois Jacob and Matt Meselson) and the other from Jim Watson’s group, with several co-authors, including Wally Gilbert. The Message uses two fictional characters, one from Brenner’s group and one from Watson’s group, who participated in the discovery. They are meeting in the present time and reminiscing about the race. They are friends but old tensions and rivalries that have simmered for years come back to the surface, including their relationship with a student of one who married the other. The play illustrates the role played by ambition and competition in scientific breakthroughs, and the desire for recognition and credit. 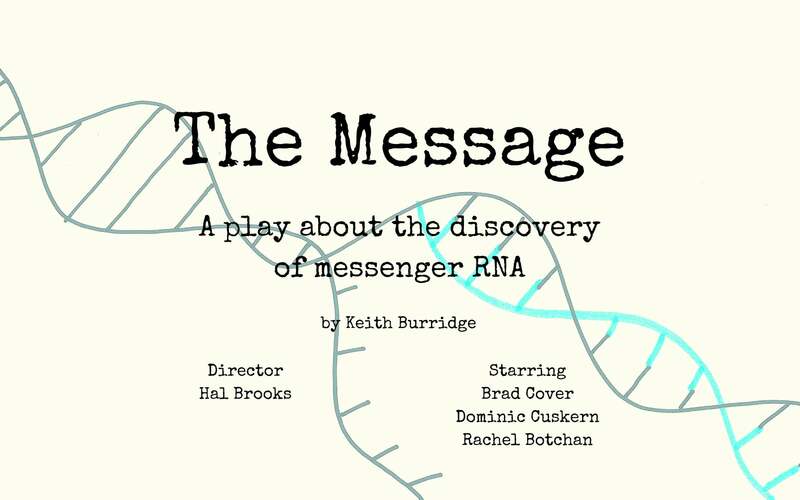 Written by Keith Burridge – Keith Burridge is a scientist by day and a playwright by night. He did his PhD at the MRC Laboratory of Molecular Biology and was a postdoctoral fellow with Jim Watson at Cold Spring Harbor Laboratory from 1975 to 1977. Staying on at CSHL for another four years as a staff scientist, he then moved to the University of North Carolina where he is Kenan Distinguished Professor of Cell Biology and Physiology. He has been writing plays for over a decade. His play “The Art of Deception” won Best New Play of 2014 from Playwrights First, NYC. His play “The First Woman President” was performed at the Midtown International Theater Festival in New York in November 2016, days before the last US election. Directed by Hal Brooks – Hal Brooks is a Brooklyn-based director. He has been Artistic Director of Cape Cod Theatre Project since 2012 and is the Associate Artistic Director of Ojai Playwrights Conference. He has worked regionally, internationally, Off-Broadway and on Broadway. As Artistic Director of the Pearl Theatre Company, Brooks accepted an Obie Award last spring for artistic excellence. Brooks is a member of the Lincoln Center Theater Directors Lab and a recipient of an NEA-TCG grant for directors. He has been a lecturer at Yale College since 2010. Brad Cover – Broadway: A Thousand Clowns. Off Broadway: A Taste of Honey, The Ding Dong, Uncle Vanya, You Never Can Tell, The Twelve Pound Look, Henry IV Part I,The Philanderer, The Bald Soprano, Rosmersholm, Hard Times, Tartuffe –among others. (The Pearl Theatre Company. The Cartells (Drama Dept.) Love Goes to Press (The Mint). Return of the Prodigal, (The Mint). A number of staged readings with The Actor’s Company Theatre. Regional: Under a Red Moon (Human Race) Heartbreak House, Picasso at the Lapin Agile (Two River Theatre) Little Foxes, Measure for Measure, Complete Works of William Shakespeare, Love’s Labor’s Lost (New Jersey Shakespeare Festival) The Blue Room, The Importance of Being Earnest (Cleveland Playhouse) Betrayal (Vermont Stage Co.) Learned Ladies (McCarter Theatre) Lives of the Saints (Philadelphia Theatre Company) Sleuth, Othello (Pennsylvania Shakespeare Festival) I Hate Hamlet (New London Barn) An Empty Plate at the Cafe de Grand Beouf (Berkshire Theatre Festival), Charley’s Aunt (St. Michael’s Playhouse), Love’s Labor’s Lost, King Lear (Texas Shakespeare Festival) Television: Elementary, Person Of Interest, The Good Wife, Law and Order, All My Children. Dominic Cuskern was on Broadway in Inherit the Wind starring George C. Scott. He played Labisse in the National Tour of Victor/Victoria. He has created four roles in plays by Terrence McNally including the role of Ganesha, the Hindu god, in A Perfect Ganesh. He is a member of the Resident Acting Company in New York City. Rachel Botchan has appeared Off-Broadway in “God of Vengeance” (La MaMa) and over 40 productions as a member of the resident acting company of The Pearl Theatre Company. She received Equity’s Bayfield Award for her performance as Anne in “Richard III” at The Pearl and a Barrymore nomination (Best Supporting Actress) for Joan in “Orson’s Shadow” at Philadelphia Theatre Company. She has also appeared regionally at Two River Theatre, Milwaukee Rep, Virginia Stage, Rep Theatre of St. Louis and Cincinnati Playhouse. Rachel is the daughter of molecular biologist, Mike Botchan and spent the first 7 years of her life living on the CSH lab grounds.